​ MANSFIELD – On the heels of its first DFW location, Flix Brewhouse is back for more, this time in a 35,000-sf location at The Shops at Broad in Mansfield. The theater will be located at the northeast corner of US Hwy. 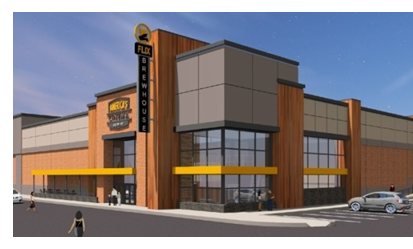 287 and East Broad St.
A Flix Brewhouse at Main Marketplace in Little Elm announced last year is scheduled to open in spring 2018. The Flix Brewhouse concept combines the latest Hollywood productions, brewed on-premises craft beer and food–all served in the theater. Flix differs from other dine-in theater concepts as the only first-run cinema that is also a fully functioning craft brewery.